ATLANTA, May 14, 2018 /PRNewswire/ — Noble Investment Group (“Noble”) today announced the acquisition of the Residence Inn by Marriott Tampa Downtown. The newly renovated, all-suite hotel is prominently located in the central business and financial district of the Tampa Bay area. Companies with a major presence in downtown Tampa include Bank of America, BB&T, Marshall & Ilsley, PNC Financial Services, SunTrust, Sykes Enterprises, TECO Energy, and Frontier Communications. The hotel is also proximate to the University of Tampa, Straz Performing Arts Center, Tampa Convention Center, and the Port of Tampa. The Residence Inn by Marriott Tampa Downtown features 109 studio, one and two-bedroom suites, each with fully-equipped kitchens. The hotel offers a 24-hour business center and fitness center, laundry facilities, grocery shopping service and complimentary internet access throughout the hotel. Guests can enjoy a complimentary hot breakfast, served daily in the Gatehouse, as well as evening socials each Monday through Wednesday. Other amenities of the pet-friendly hotel include an outdoor pool, whirlpool, BBQ & picnic area and SportCourt. The hotel also offers nearly 1,000 square feet of flexible meeting and board room space. Less than a mile from the hotel, the Channel District is undergoing a $3 billion redevelopment and the University of South Florida College of Medicine is opening a new facility next year which will bring over 2,275 faculty, researchers, and students to the area. For more information or to make reservations, please visit ResidenceInn.Marriott.com or call the hotel directly at (813)-221-4224. 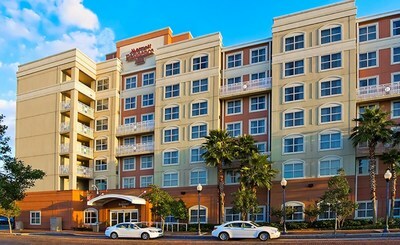 The Residence Inn Tampa Downtown is owned by Noble Investment Group and managed by McKibbon Hospitality, a leading hotel development and management group headquartered in Tampa’s Avion Park. Residence Inn by Marriott is the global leader in the extended-stay lodging segment, with more than 700 properties located in the United States, Canada, Europe, the Middle East and Central America. Designed for long stays, the brand offers spacious suites with separate living, working, and sleeping zones. Fully functional kitchens; grocery delivery service; 24-hour markets and complimentary breakfasts help guests maximize their time and thrive while they travel. Each Residence Inn offers free Wi-Fi in both public and guests spaces to ensure continuous connectivity while on the road. As a member of the Marriott International portfolio, Residence Inn participates in the award-winning Marriott Rewards frequent guest program. Members earn their choice of points toward free vacations or frequent flyer mileage for dollars spent at any of the more than 4,000 Marriott hotels worldwide. For travel tips, the latest on the brand or to connect with other travelers, “like” Residence Inn on Facebook: www.facebook.com/residenceinn and follow Residence Inn on Twitter: www.twitter.com/residenceinn. Since 1993, Noble has specialized in making value-add, opportunistic and income investments in upscale select service and extended-stay hotels affiliated with Marriott, Hyatt, Hilton and Intercontinental. Through its private equity real estate funds, Noble has invested more than $3 billion in communities throughout the United States, creating thousands of jobs. As a fiduciary to state pensions, university endowments and foundations, Noble’s endeavors help to preserve and grow our limited partners’ capital which provides retirement benefits for millions of our country’s teachers, policemen and firefighters as well as financial resources for students to attend college. For more information, please visit www.nobleinvestment.com.